I will be experimenting with a new type of article as I am currently traveling around Turkey for plant collections. I traveled from the capital, Ankara, to areas in central Turkey and finally along the Mediterranean and up along the Aegean sea to Istanbul. I have found that Turkey cultivates a wide range of edible plants as crops, many of which I did not expect. There are also a good deal of wild varieties of common edible plants as well (i.e. Peas, Pyrus, Malus). Turkey is a country diverse in climates and habitats, in some areas Tobacco and Tea are cultivated, and in other places even Kiwis are cultivated! Some of the interesting plants of Turkey I have come across include temperate crops, tropical fruits, and spices. To list a few: Cicer, Apple, Pear, Pomegranite, Apricot, Peach, Poppies and Anise, among many more common crops. 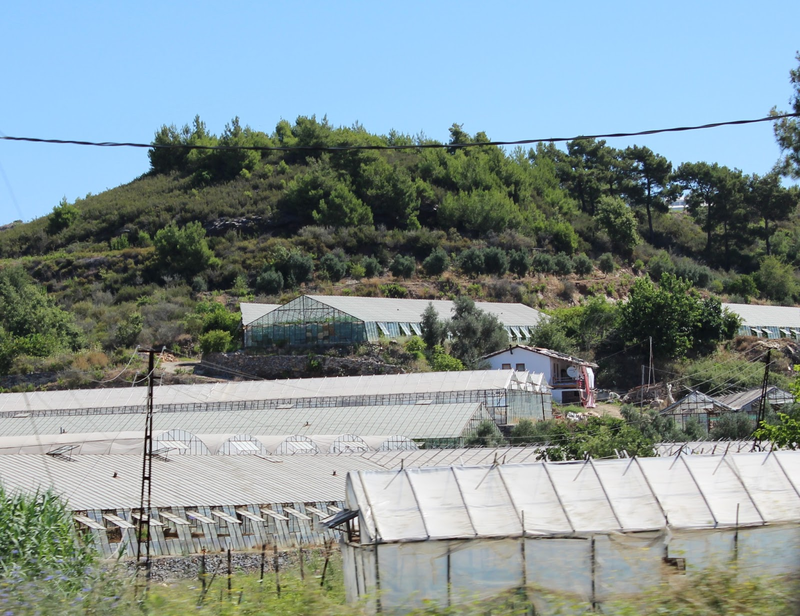 I was surprised though to see a wide range of tropical plants being cultivated in the Mediterranean region of southern Turkey. The land that is very close to the Mediterranean sea is capable of supporting many tropical fruit trees. There are some people in this region that grow Jackfruit, Durian, Papaya, Bananas, Oranges and other tropical plants. I would assume that many types of tropical fruit could survive in this region because it is consistently hot and humid with no freezes. Turkish farmers have taken advantage of this climate and built countless greenhouses near coastlines in order to cultivate tropical fruits, especially bananas. There are many open-air banana farms as well, with many street vendors selling bananas and other fruits, especially oranges. Street vendors in the rest of Turkey are mainly restricted to selling melons and other temperate crops. Poppy crops are not a common sight in the Turkish country side but occasionally in some areas you will find large fields filled with poppies that are cultivated for bread seed and spice. This picture was taken from the road to Antalya. Banana farms such as these are extremely prevalent in a close proximity to the Mediterranean sea. Along the Mediterranean there is also a very large number of greenhouses that are used to cultivate many crops. My best understanding is that many of these are used to cultivate bananas, but I am curious to know what other plants are cultivated in these greenhouses. The Carambola aka Starfruit is a geometrically stunning, tender sweet fruit that comes from the Averrhoa carambola plant. This plant is in the Oxalidaceae plant family from which wood sorrels come from, as well as some rather nasty weedy species that tend to overrun my greenhouse! There are many varieties of Starfruit and the diversity is a novelty in itself, but in general there are two types of Starfruits, the sweet and the sour ones. greenhouses it typically maintains a smaller, bushy growth habit; Perfect for grabbing those low hanging fruits. The flowers appear in dense infloresences that provide much color and often hundreds of flowers. Most of these flowers will not succeed in becoming fruits, likely due to the fact that the plant can only expend so much energy in fruit production. It has several blooming cycles throughout the year, which are probably dependent on conditions like temperature and water/nutrient availability. Propagation of Starfruit trees is similar to most woody tropical plants, in that they can be effectively propagated by seeds and cloned by cuttings. In the case of growing Starfruit trees, growing by cutting or by air-layering would be ideal. I have no experience in propagating Starfruit trees this way because I don't have access to any live starfruit trees. If you live in a tropical region and have a nearby nursery or friend that owns a starfruit tree then your best option may be to propagate vegetatively through cuttings. For all others propagation by seed may be your only option. Starfruits can be purchased in specialty grocers and a single fruit can yield a dozen seeds. 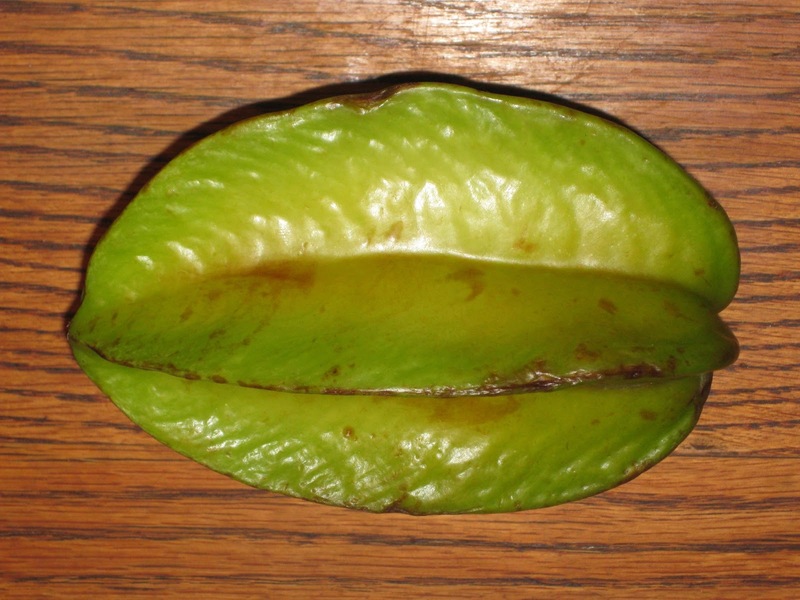 If you are unable to find a Starfruit you could try buying seeds on the internet. It is important to get seeds that are fresh as these will have the highest rate of germination; therefore plant your seeds as soon as you get them. Growing Starfruit trees by seed: I have experience growing starfruit seeds from the internet and from fresh fruits. The key is to keep the seeds moist and warm. This was easy for me in my greenhouse as it is constantly moist and warm, I simply sowed the seeds about 1/4 inch in soil. Alternatively you could place the seeds in a moist paper towel in a plastic bag and place them in a warm dark place in your house (On top of the refrigerator). In optimal conditions the seeds may germinate in a week but I find that germination is typically closer to 3-4 weeks. Growing Starfruit trees is tricky, even in tropical greenhouses. Seedlings often grow very tall with minimal branching making them prone to falling over or severing the stem. This may be caused by too little sunlight (they grow best in full sun) or by early application of fertilizers. You should wait until your starfruit is a few years old before you fertilize it. If you find that your Starfruit tree is getting too tall and is not branching you should cut the top off (The small growing bud at the top of the plant = apical mersitem); by topping the plant you force the plant to grow axillary branches and assume a bushy growth form. Starfruit trees grow best in slightly acidic soil that drains well. Overwatering can be a problem for Starfruit trees and you should not water the soil if it is already very damp. This is a matured pineapple flower as it develops into a fruit. Few stop to think about what a pineapple actually is, and refer to it as a single fruit. In reality a pineapple is botanically considered a multiple fruit because it is the product of many fertilized flowers that form individual fruits which are fused together into the pinecone-like structure of a pineapple. Pineapples come from the genus Ananas from which there are many pineapple lookalikes. Most species from Ananas are ornamental, forming smaller but beautiful fruits some of which may be edible. The pineapples that are eaten and cultivated across the world come from the Ananas comosus plant. The genus Ananas is in the family Bromeliaceae of which Bromeliads come. Bromeliads are monocots that usually have long slender and basally arranged leaves. They are known to have many specialized features such as water/nutrient storage structures between leaves that collect falling water and debris to aid plant growth. Many bromeliads are epiphytic and grow high above the ground attached to tree branches. This is not the case in Pineapples which are instead terrestrial, favoring the formation of strong roots that anchor themselves to the soil while collecting nutrients and water. Propagation of pineapples can be done through three reliable methods, by seed, by top rooting and by vegetative "pups". Propagation by seed and top rooting are the only options if you don't already have a growing pineapple. Firstly you must obtain a pineapple, which are common almost year round in many U.S. grocery stores. It is best to choose pineapples that have healthy looking tops, especially if you choose to propagate by top cutting. Avoid pineapples with browned or yellow top leaves. To propagate by seeds you must cut your pineapple and examine the flesh for small reddish-brown seeds. The seeds are only found in the outer flesh of the pineapple in small compartments under the hardened "skin" of the fruit. I've found that some pineapples have very few seeds or even deformed seeds which is likely the product of industrial cultivation methods. If you can find some seeds, collect them and wash them. You can plant the seeds in potting soil or wrap them in a wet paper towel and place them in a plastic bag. Be sure to keep the soil or paper towel moist and in a warm place. Within a month they should sprout. Pineapple seedlings are delicate and require warm (70-80F) temperatures and high humidity. To propagate by pineapple tops (probably the easiest method), you must gently twist the pineapple top at the base where it connects to the fruit. It should twist off with a little elbow grease and you will be left with what looks like a young pineapple plant. Remove the remaining pineapple flesh at the bottom of the fruit to prevent rot. Next remove the small leaves at the base of the pineapple so you expose 1/2 inch to 1 inch of stalk. You will see small roots and root buds, with proper care these will become vigorous roots and your pineapple top should become a healthy pineapple plant. There are many methods for encouraging these roots to grow, whichever you choose you should place the plant in a warm area away from direct sunlight. You can wrap the exposed roots in a wet paper towel and place a plastic bag or saran wrap around the bottom to prevent the towel from drying out. Alternatively you can fill a glass with water and place the top in the glass so that the roots are submerged. The water should be replaced every few days for better results. In less than a month, if you are successful your pineapple top will have healthy young roots and it can then be transplanted to soil. If you want to avoid all of this hassle you can plant the pineapple top directly in soil, which has a lower success rate. Pictured above is the result of twisting a pineapple top off of the main fruit. The flesh at the bottom should be cut off and the lower sets of leaves removed to obtain a result similar to the picture below. The pineapple top should be placed in a cup of water, wrapped in a wet paper towel or put into a pot with soil to encourage root formation. After a about 2-4 weeks the pineapple should have vigorous roots, as pictured below. Sometimes, however bacteria and fungi get the better of a pineapple crown, resulting in rot. Be patient and plan on experimenting with a few pineapple crowns to ensure success. After about six months to a year your pineapple top should look something like the pineapple pictured above. In about another year, if you are lucky, your pineapple might flower and produce a new pineapple! After a pineapple is harvested the plant often dies and sends out vegetative clones called "pups". These pups will grow around the base of the plant and will each grow into a new plant. As the pups mature it is possible to divide them and replant them to expand your pineapple growing operation! This ornamental pineapple had many pups that were left undivided resulting in a very compact and bushy congregation of many mature pineapple plants. Biosphere 2 was used as a private research station for the development of new technologies and science. The goal was to completely seal crew members in a massive air-tight greenhouse to study self-sufficiency (among other things) in a closed system. The first mission included eight members and lasted two years. Unfortunately the media mocked the project and the public misunderstood its significance. Due to a number of miscalculations and set backs only two missions were conducted in the Biosphere 2. The Biosphere was amazing for a number of reasons but it wasn't the first closed ecosystem experiment. The Russians worked on a similar program called BIOS-3 in the 1970's but their facility was much smaller and could only conduct short experiments. What set Biosphere 2 apart was its massive size and truly innovative engineering. For example: In order to maintain an enclosed atmosphere artificial lungs were required to manage the air flow and pressure throughout the facility. Below you can see the massive mechanical lungs within the facility. There is a black balloon-like lining that encircles the ceiling of the room that can be inflated/deflated to regulate the atmosphere in Biosphere 2. The significance of the Biosphere 2 project is often overlooked, in-fact many people are totally oblivious to its existence. During the two enclosure experiments the entire facility was air-locked and its design prevented air exchange with the outside. Thus there was a delicate balance of gases inside the system which was a very important topic of research. The project also boasted waste and water recycling. Space agencies are interested in this kind of research, especially for projects such as Lunar or Mars colonization. Totally enclosed and self-sufficient enclosures would be required for any kind of research outpost on the Moon or Mars, so this research seems to be more and more relevant with time. So you may be wondering what all of this has to do with edible tropicals? Well, the crew members of Biosphere 2 were responsible for cultivating and managing many ecosystems including a Desert, Marsh, Savannah, Scrubland, Ocean, Tropical Beach and of course a large Rainforest. The plants grown in the Biosphere 2 were used by the crew members on a daily basis for food. The crew members harvested many edible plants from the rainforest sector, including Bananas, Ginger, Papaya and Coffee. In addition to this the crew had an orchard located directly next to their living area. In the orchard area there was even more cultivation of Bananas, Papaya and Coffee but also more temperate trees such as Figs. Above is the kitchen the crew members used during the enclosure experiments, and below is the orchard they used to cultivate many of their fruits. On the bottom right is a coffee tree, one of many in the facility. This is a view of the "Control Tower" computer system. This is a view from the beach looking up to the cliffs above. There are many tunnels and underground maintenance areas that snake around below ground level of the facility. The crew was responsible for maintaining all of the water and waste systems within these tunnels. Columbia University used the facility for many years, however I've been told that they left it in very poor shape, opting to only do research of their interest and to let other systems degrade. For instance they left the ocean system in complete disorder. Recently the University of Arizona was given control of the facility. The UofA is now working to fix many of the systems, but is also conducting a wide range of research projects within the Biosphere 2. The Landscape Evolution Observatory project (LEO) is a new project by the UofA that replaced the farm sector of the facility with a sloped soil bed infrastructure. LEO's objectives are to understand water and material movement through the earth and to study climate change effects. Despite its use for some research projects, it remains open for public tours. Unfortunately another enclosure experiment is not possible due to the required maintenance and technical issues with the facility. If this kind of research is interesting to you, I highly encourage you to read-up on Biosphere 2, BIOS-3, and MARS-500. Perhaps this type of research could be rekindled if not for the purpose of scientific understanding, then for the sake of inspiring the youth of the world.